Is ‘PUBG Mobile’ Better Than ‘Fortnite’? The Fortnite vs. PUBG battle comes to mobile, as versions of both titles are currently on mobile. But which game is the better mobile experience? While the two games are different takes on the battle royale experience with their own visual styles and gameplay options, it is possible to compare how the two play on mobile. As of the Fortnite (Free) Invite Event launch and the PUBG Mobile (Free) release, PUBG Mobile feels like the superior game for mobile, but there are plenty of caveats to that, and Fortnite might someday match PUBG Mobile‘s level of performance. For one, let’s compare the visuals, especially on lower-end hardware. On the iPad Air 2 (which is identical to the 2017 iPad, which you can still buy from Apple), Fortnite is riding the Struggle Bus into battle. The game has the occasional freezing hitch here and there, and the visuals are at such a low resolution that it makes it tough to tell where far-off targets are. If you have a modern device, it looks a lot better, though the game is still just 30 frames per second. PUBG Mobile isn’t a beautiful game, but in comparison to Fortnite it’s a stunner. This might be due to PUBG Mobile‘s nature as a mobile-native game, versus Epic adapting Fortnite to mobile. PUBG Mobile also runs on older devices, with users on iPhone 6 devices able to run the game. You can get higher frame rates on PUBG, and have options to configure your graphics. Fortnite is hardly pushing the hardware to the limits in its initial release – battery drain seems limited, and it’s not turning the iPad into a portable heater. Between further optimizations and perhaps pushing the hardware a bit more, Fortnite could start to look better, especially on devices. Its cross-platform code base might mean it’ll never look or perform as well as a title built for mobile first like PUBG Mobile, though. However, Fortnite‘s disadvantages as a mobile title also come with advantages for the player experience. There’s the obvious cross-platform multiplayer functionality. And also, there’s the content parity with the console/PC versions of Fortnite because this is just a Fortnite client. PUBG Mobile is a separate version, so you can’t play with your friends on other platforms. And if a feature comes to one version of PUBG, there’s no guarantee that it will arrive to the mobile version. Whereas everything new in Fortnite will be in the mobile version. It’s also worth noting that Fortnite is in its first public release, while PUBG Mobile is a few weeks older in terms of development. Tencent also has a lot more experience with mobile development, which might explain why PUBG Mobile feels like a better game right now, because they have an army of developers that have worked in the genre. Meanwhile, Epic does have mobile experience, but not in the genre of third-person shooters. However, Epic has a lot of resources and developer talent to use, and plenty of examples to crib from for the game’s controls. It’s quite possible that in the coming weeks and months, Fortnite‘s controls and visuals improve to where the difference with PUBG Mobile is slight. Controls-wise, PUBG Mobile is better than Fortnite. A big reason is the inclusion of a fire button. Fortnite‘s Invite Event launch makes firing on the right side of the screen require a very quick tap, with any slightly-long tap trigger aiming. Having a dedicated fire button, with dragging to then aim, helps out a lot in PUBG Mobile. Both games wisely have a fire button on the left side of the screen to make it easier to aim then fire. PUBG has a gyroscope aiming option for precise movements that players should consider, since it works rather well for Switch FPS games. Fortnite has an additional degree of control complexity with its building elements that PUBG Mobile doesn’t have. It might need some revamped building control options to streamline the experience, as it is a bit clunky right now on mobile. Then again, building isn’t exactly a smooth experience on controller, either. FortCraft actually has some good building controls that Fortnite should shamelessly lift. It would only be fair, after all. Fortnite in general could use some more control options, but it’s possible that versions beyond the initial Invite Event release might see new options come out. It’s a bit unfair to compare the two, but on the other hand, Fortnite is taking people’s money. It’s fair to criticize the game in its current state while also remaining open to the fact that it is still in development. Fortnite also has controller support on the way, which will give it a playability advantage over PUBG Mobile (unless it adds in some kind of controller support), though small movements are far easier on the touchscreen. I don’t think that controller vs. touchscreen is quite the unfair fight once someone gets comfortable with touch controls. Monetization in Fortnite is far easier to comprehend, though both games avoid any kind of paying for gameplay advantages. In Fortnite, you can buy V-Bucks, and spend them on cosmetic items. You can spend roughly $10 to buy the Battle Pass, which allows you to unlock items as you complete challenges and missions for the current season, which runs for a few months. You also can earn enough V-Bucks from the Battle Pass alone to pay for your next Battle Pass. Additional items are available on a daily basis through direct V-Bucks purchase. However, it is tough to earn V-Bucks for free, so most cosmetic items require real-world spending. Meanwhile, PUBG Mobile uses a similar system as Rules of Survival (Free) and similar titles. You earn gold coins through gameplay performance, daily logins, and completing missions. You can spend coins to unlock chests for random items, but there isn’t a way to buy specific items yet. In fact, try finding a way to spend real-world money at all yet. It’s surely coming in a future update. Whether either title is better depends a lot on individual taste. The objectives are the same in each game, to be the last person or squad left standing. PUBG notably includes vehicles, while Fortnite doesn’t have vehicles but does have building. The games differ a lot in terms of pacing. PUBG Mobile is a much slower-paced game, where right now in Fortnite, the opening moments see a massive culling of players, which help to make the matches shorter and feel better on mobile. Part of this might be due to the popularity of the Tilted Towers region and its abundance of loot. Future map or loot balance changes might have a massive impact on pacing. Fortnite is perhaps the more approachable game: it is more colorful, and using fictional weapons with self-descriptive names (though these don’t appear on mobile yet!) makes it a bit easier to get into initially. PUBG Mobile uses real weapons, and you might not know the differences until you actually use them. Early on, PUBG is suspected by other players to have bots early on, so you might see some impressive results in your early battles that you might not be able to replicate as you climb the ranks. Fortnite doesn’t have any similar rank-based matchmaking, it’s all chaos out there and you might get dusted by a high-level player your first time out if you drop in the wrong area. I will say that getting a “Winner Winner Chicken Dinner" is just better than a “Victory Royale." As a mobile app, I’d say that PUBG Mobile, as of March 19th, is the better app. It looks better, runs better (especially on older hardware), and controls better. But Fortnite‘s downsides are not fatal flaws, issues with controls are fixable, and the game still plays well on mobile despite its issues. Fortnite‘s track record of regular updates might make it the more engaging title over time, and if Epic Games keeps improving regularly, then Fortnite might be the better mobile game. 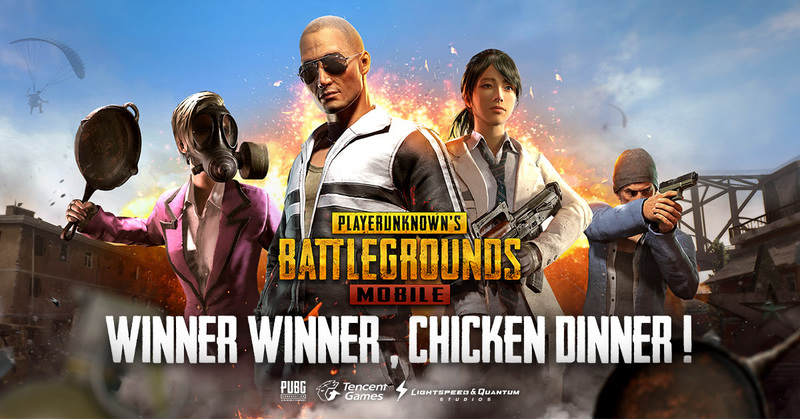 But purely from the perspective of which is the better mobile game experience, PUBG Mobile is currently the winner. If you’re playing either game, or both, make sure you join our channels on our Discord server for each game, where you can share invites, squad up, and share your best moments.